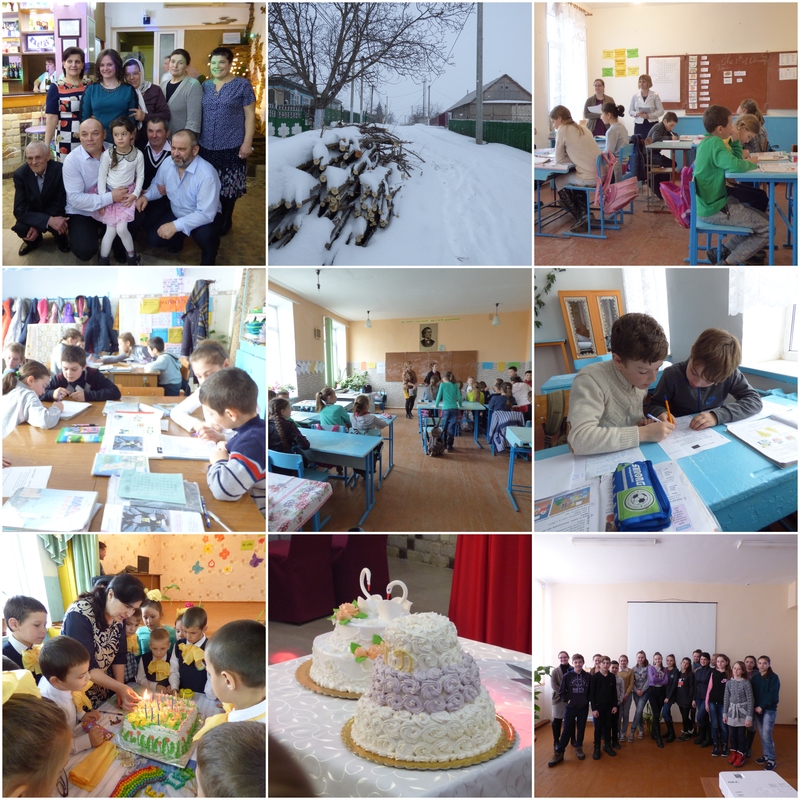 Today marks two years in Moldova! I almost can’t believe it! In some ways, it seems like just yesterday that I was getting off the plane in Chisinau and taking my first steps on Moldovan soil, while in other ways it seems like a long time ago. This last quarter of my time here has been filled with its share of both ups and downs. According to the “cycle of vulnerability” as a Peace Corps volunteer, this is apparently quite normal. I still a little over one month left here, but I’m sure that time is going to pass quickly. The past 6 months have been a whirlwind of emotions, both excitement that I’ll soon be returning home, eating American food, and spending time with my friends and family, and sadness that I’ll be leaving this beautiful country and its wonderful people behind. In particular, I’ll miss the abundance of fresh fruit and veggies in the summer months, the sunflower fields that stretch on forever, my host family, my teaching partners, and my students. I know it’s almost time to move on to the next chapter of my life, but it is definitely bittersweet. 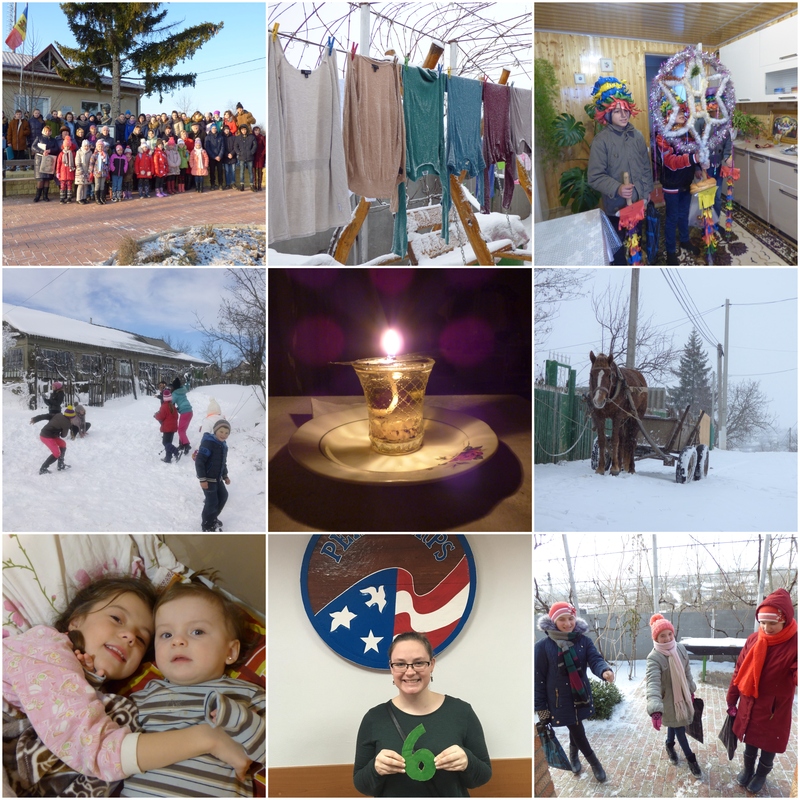 Anyway, here is the recap of my fourth six months in Moldova (you can find the recap of the first six months here, the second six months here, and the third six months here). At the beginning of the month, I accompanied the dance ensemble from my village to an international talent competition in the capital, spending the day with my students and their dance instructors. I observed a Russian lesson with 8th grade students and didn’t understand a word. In English Club, we did a US state poster project, which the students got really into. We had some gorgeous sunsets, as well as our first light snowfall. We celebrated Sfantul Andrei, and I attended a Christmas/New Year concert, also with the dance ensemble, in our raion center, and spent a morning in the capital with my host mom and her friend, Natasha. I spent Christmas at home in upstate New York with my family, with two weeks packed with holidays, celebrations, and spending time with family and friends. The month started off at home in the US, skiing and hanging out with my grandparents, family, and friends. The trip back to Moldova was a bit of a terrible adventure, when I got stuck in the JFK airport for over 24 hours. Celebrated Moldovan Christmas at home with my host family, and welcomed carolers and seed-throwing kids to welcome in the New Year. One of my 8th grade classes sang Happy Birthday to me on the first day back to school. Celebrated Mihai Eminescu Day outside in freezing temperatures. Went with one of my partner teachers to meet a man who is bed-ridden and who really wanted to meet the “American” in the village, had a really great conversation with him. Had our first heavy snowfall, and even a snow day! Was ambushed by some neighborhood kids by snowfalls and fistfuls of snow. Lost power and spent a night in candlelight. Had our COS (close of service) lottery and found out when I’d be going home. The snow started to melt a little. Celebrated English Week at school and taught an open lesson with my partner teacher. Wore my hair down to school for the first time and got lots of compliments. Attended a 100 Days celebration with 1st grade students and stayed for a masa afterwards. Attended my host cousin’s wedding, and danced with my host nieces. Accompanied two students and my site mate to a GLOW mini-camp in the capital. Every student in one of my 8th grade classes did their homework (a first!). Kicked off Peace Corps Week with a mini “International Film Festival” with our students, showing short videos made by volunteers from all over the world. Spent much of the month relaxing and hanging out at home. We continued Peace Corps Week with a video-chat with a class in the United States and inviting several other Peace Corps volunteers to come speak to our students about where and what home is to them. Both events were a big success! 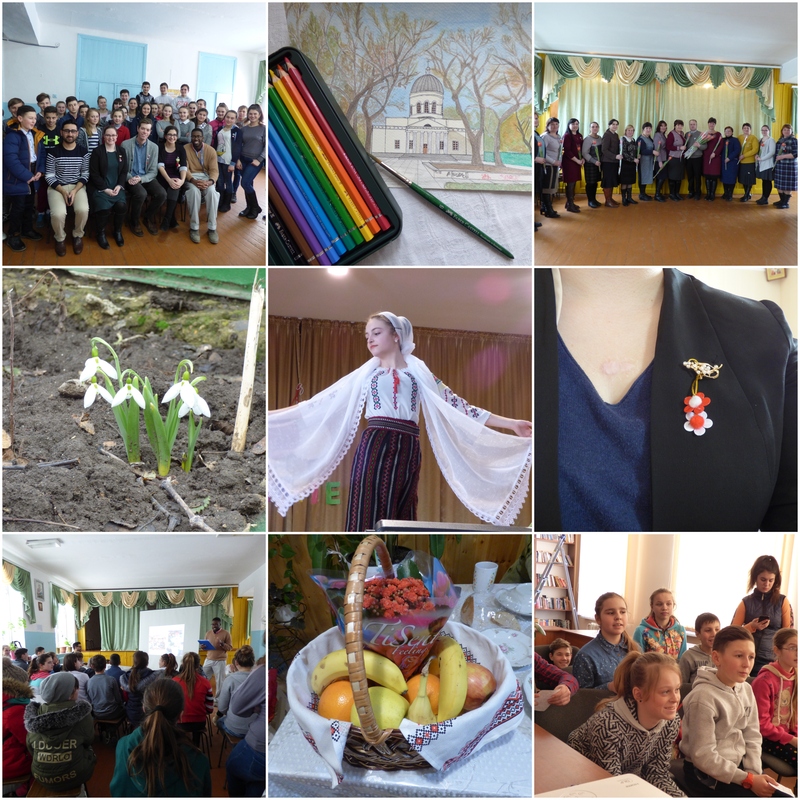 We celebrated Martisor, as well as International Women’s Day both at school and in the community with a big concert. Had “control” or an audit at school and helped my partner teachers prepare food for the guests one day. The first flowers started showing up in the garden, and we celebrated my host mom’s birthday. 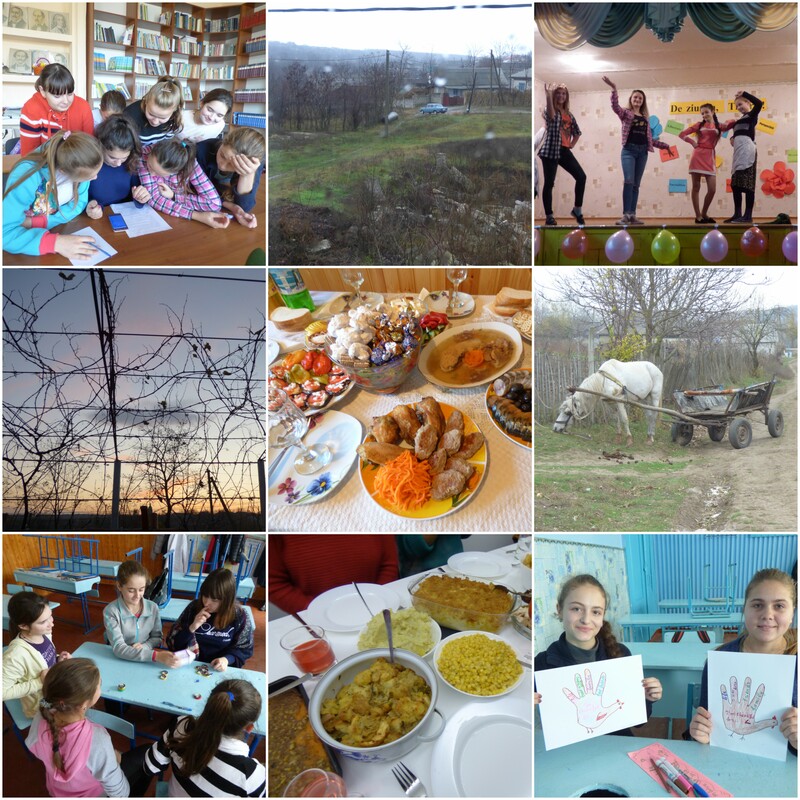 The village prepared for Easter, and students got out of lessons early one day to do a village clean-up. We celebrated Easter by going to church early in the morning and then eating and sleeping the rest of the day. My host niece, Valerica, visited and we spent a lot of time playing together. Ate cake for Valerica’s 8th birthday. We celebrated Memorial Easter (in memory of loved ones who have passed) at the cemetery and at our house with a meal after. The flowers began to bloom in full force, and the fruit trees blossomed. Met with the Parent’s Association to make plans for a summer day camp, and got their approval! Went to my partner teacher Liuba’s birthday party, and had a lot of fun. Started off the month at our COS (close of service) conference with my fellow volunteers. Victory Day was celebrated in my village with a short ceremony at the World War II monument and students and community members placed flowers around the monument. Ate the first strawberries of the year, and picked cherries. Had an “American masa” with my English Club to thank them for coming so regularly throughout the past two years- we ate a lot of yummy American foods. Attended Peace Corps Moldova’s 25th anniversary celebration along with my partners and school director. Had my last lessons with my students and celebrated Last Bell, the celebration that marks the end of the school year, and further celebrated with a barbecue in the woods with my fellow teachers. 2017 was a good year. 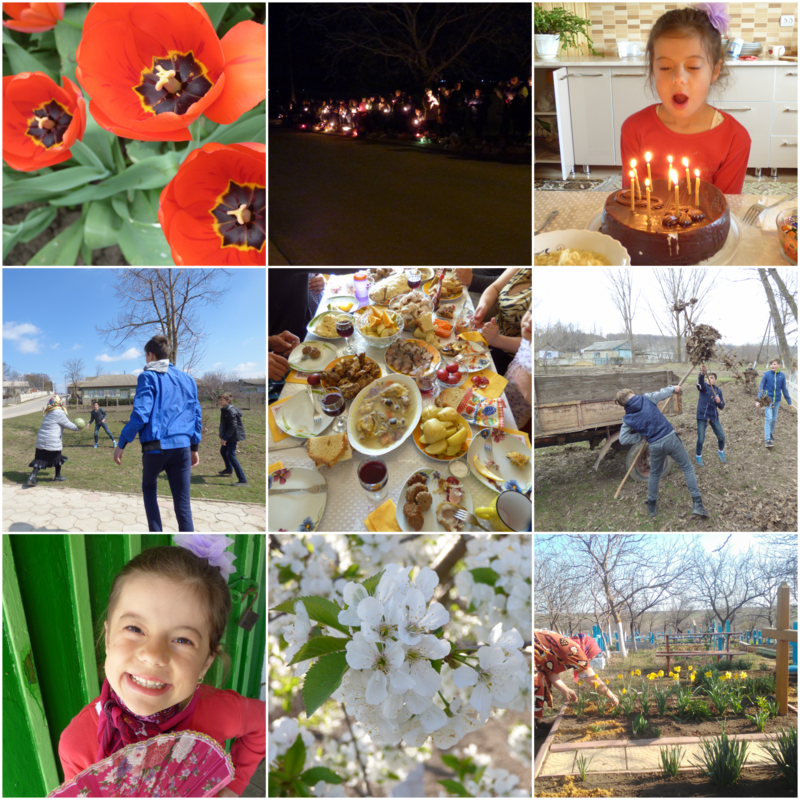 This was my only complete calendar year spent in Moldova, and I’m so lucky that I’ve had such an amazing adventure here. 2017 wasn’t without its challenges, but it really was a year full of wonderful memories, fun adventures, and special moments. Here my top 20 memories and moments from the past year. Graduation Ball. In July, the 9th grade students graduated from our school and had a dance and ceremony. I think this will remain one of my very favorite memories of my time here. It was one of the first moments when I felt completely a part of my community. Together with the new graduates, their parents and families, and the other teachers at school, I ate and danced until the early hours of the morning. It was a special celebration and I was so glad I got to be a part of it. Walking through the fields. In August, right before the first day of school, I walked through the fields on the margin of my village with my host mom, host sister, host niece, my sister, and a fellow volunteer. It was such a beautiful day and it was such a nice escape into nature before the school year started again. Visiting Et Cetera Winery. When my sister was visiting, we visited this winery with a friend. It was such a peaceful mini-vacation with excellent food, great lodging, and friendly people. My parent’s visit to Moldova and our trip to Romania. It was so cool to be able to show my parents around the country that is my home now, as well as to go to Romania. It was a wonderful vacation and I’m so grateful they were able to make the trip. 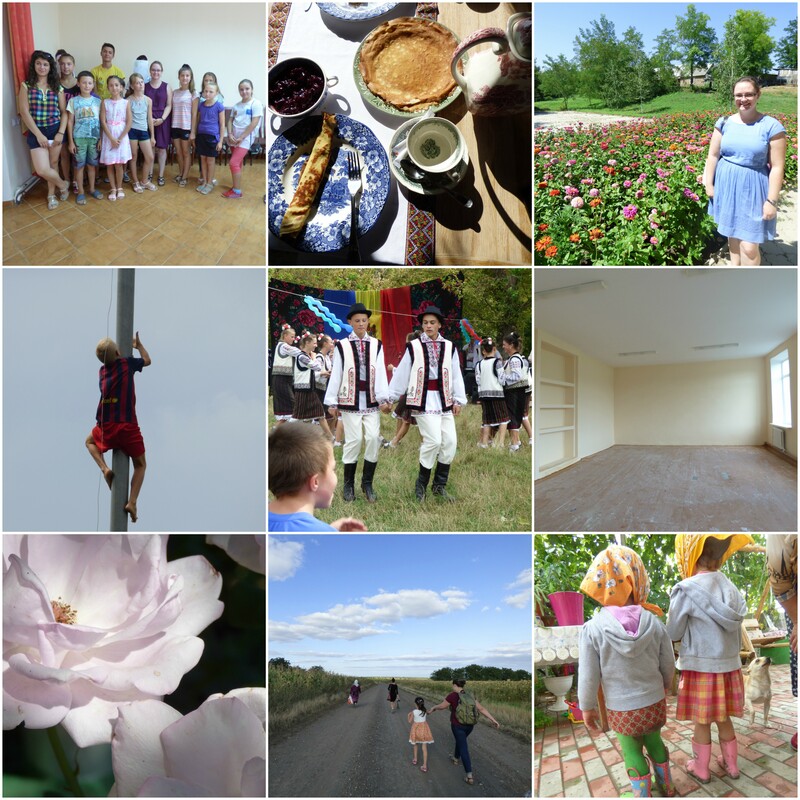 My sister’s visit to Moldova. On the same note, I was so happy my sister was able to make it here as well! It was fun to show her around Chisinau and my village and my students still talk about her sometimes (she went to the first day of school with me). Language Day Celebration. 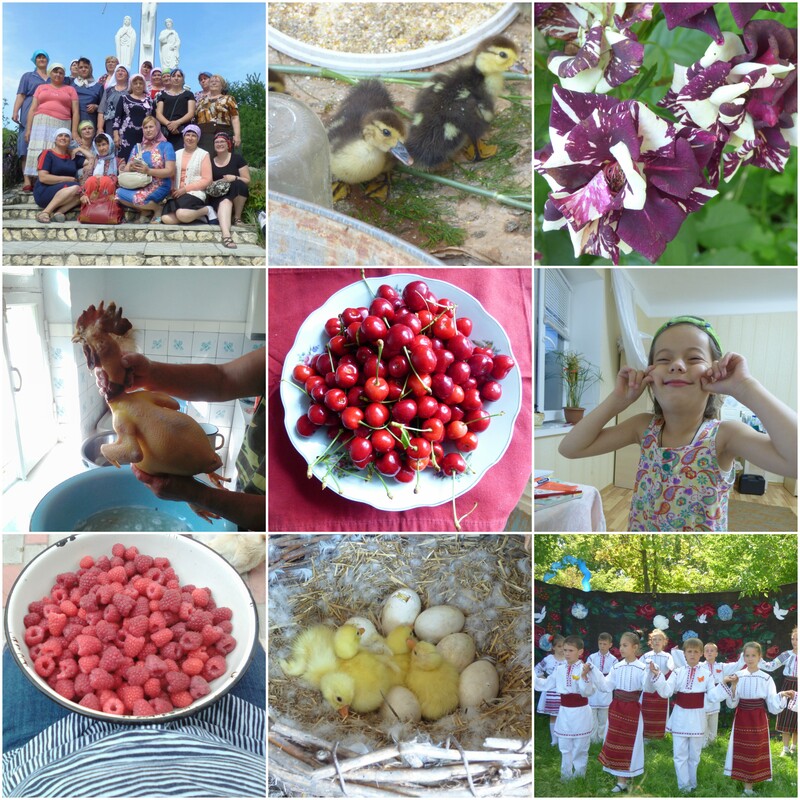 Our village went all out this year for the Language Day and Independence Day celebrations, with culinary competitions, dancing, and sports competitions. The pole climbing competition made me a bit nervous, but was fun to watch. My host niece dressing up in my clothes. One afternoon, my 7-year-old host niece, Valerica, dressed up in one of my skirts, my sunglasses, my earrings, and even my name tag! She then declared she was a model and I was her photographer. It was a fun way to spend the afternoon and she always makes me laugh! English Club. This is more like a lot of wonderful moments combined. So many of my best days in the last year are thanks to the English Club I do with my 7th to 9th grade students. Most recently, some of my students in 7th grade told me that they don’t want me to leave this summer because everything is better now that I’m here. When I asked them what they meant, they said that they want to come to school now and that they love having something to do after school. Teacher’s Day Party. Instead of doing a small celebration at the school like they normally do, the teachers at my school decided to pay a bit of money and have a larger celebration at a restaurant in the next town over to celebrate Teacher’s Day. We ate, drank, and danced the night away and everyone (including me) had a lot of fun. I also mastered (at least as much as I probably ever will) our village’s version of Moldova’s national dance, the hora. Mini-Vacation to the North of Moldova. This past spring, my friend Andrea and I took a weekend trip to the northern part of Moldova and also spent some time in Chisinau. We visited Curchi Monastery and Orhei Vechi on a guided tour. We also ate at some nice restaurants in Chisinau and attended the opening of a Himalayan restaurant. It was a really nice trip before the last leg of school. Winter Walk to Ermoclia. Last winter, after a snowstorm and freezing temperatures for too many days, my host mom and I took a long walk to the next village. The snow was pristine and the temperatures warmer and after several days cooped up inside, it was a welcome escape. We visited her friends there then walked halfway back before someone offered us a ride back to town. Teachers’ Excursion. 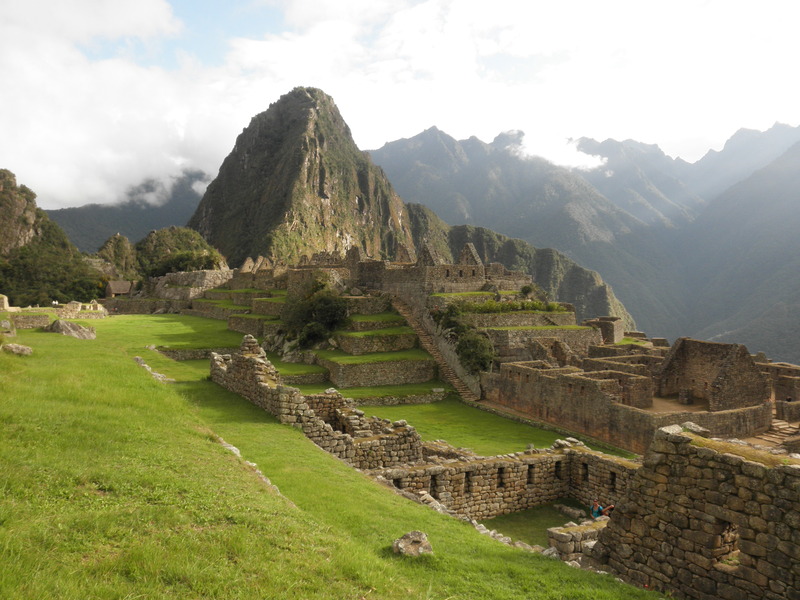 Last summer, the teachers at my school took a trip one Saturday to two monasteries in the northern part of the country. We visited Saharna Monastery and Tipova Monastery, taking in the gorgeous views and nice (though very hot!) weather. On our way back, we had a full picnic on the side of the road. It was a lot of fun and helped me get to know the other teachers better! PCV Thanksgiving. A little over a month ago, I got together with a group of volunteers to celebrate Thanksgiving. The food was great and the company even better. After spending the entire autumn in my little village, it was nice to get together with other Americans and eat all the foods we had been missing. Constelatia Talentelor. One recent Friday, I got to accompany the student dance ensemble from my village to an international competition in Chisinau. The students are all my students at school and I went to film it for them. They did a great job and I spent most of the afternoon with them, helping me get to know my students better. They actually ended up getting called back for the finals and won Grand Prize! A Day in Chisinau with Valerica. 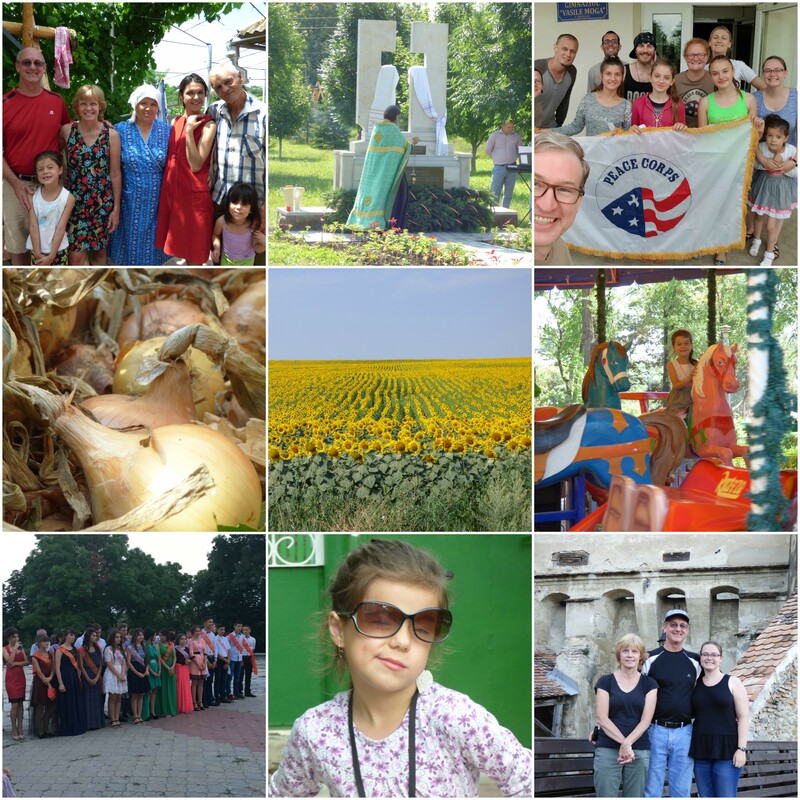 This past summer, I spent most of a day showing my host niece Valerica around Chisinau. Although she’s been to Chisinau, she hadn’t seen most of the tourist attractions, and it was really fun to see it all through her eyes. We ate (at her request) at Smokehouse, an American BBQ restaurant, where she had mac and cheese and a strawberry milkshake. Then we walked around Cathedral Park and Stefan cel Mare Park, where she got to ride on a carousel. Finally, we rode on a trolley bus (a first for her). We had so much fun! Harvesting Locust Flowers with My Host Mom. This past spring, I helped my mom harvest locust flowers to use in tea. It was great bonding time with her and I was happy to help out with something (although my fingers hurt a bit). Planting Potatoes and Collecting Grapes. My family in the United States has a small garden, but I had never really planted potatoes. I helped my host mom plant several rows one afternoon and can’t wait to do the same when I return to America in our family’s garden. I also spent some time helping my host parents pick grapes to make into wine. Welcoming Turul Moldovei to my village. Turul Moldovei, a group of Peace Corps volunteers doing a walking tour and spreading peace along the way, spent a night with my host family and me this summer. We visited our school and the local library and cultural center and spent an evening eating great food. Being Home for the Holidays. I am so, so happy I had the opportunity to come home for Christmas and the winter holidays. After spending Christmas abroad last year, it was nice to be home with my family and friends. 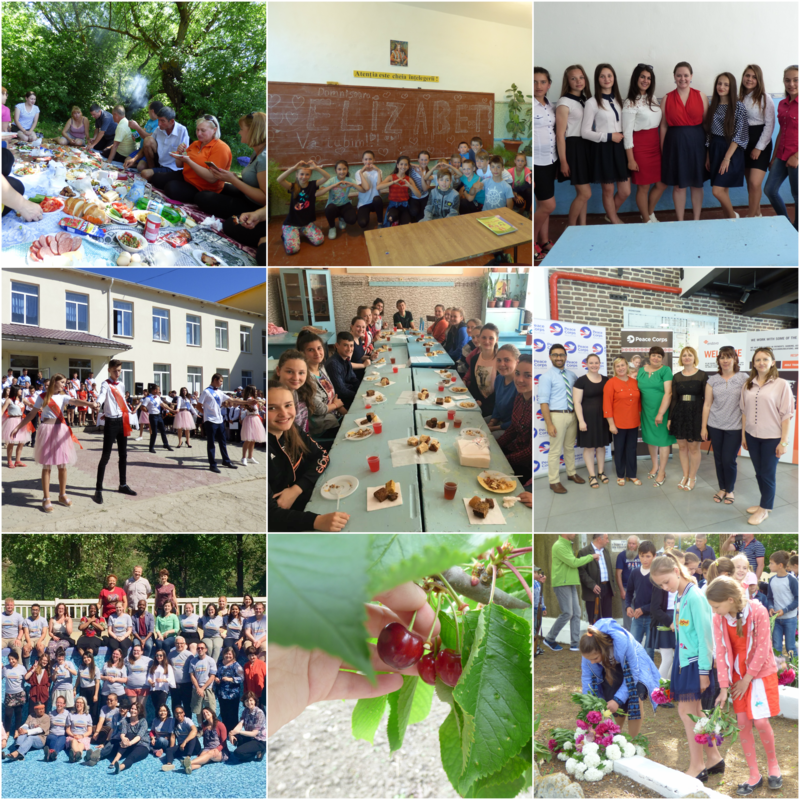 We’ve had a great two weeks and I’ll be sad to head back to Moldova later this week (but also excited to see everyone there again as well). I love my life and experience in Moldova, but there really is no place like home (however cliche that is). Well, that’s a wrap. Here’s to a happy, healthy, and successful 2018! A couple days ago I reached my one and a half year mark in Moldova. As with the first half of my time here, the time has passed quickly and I can’t believe the next of these recaps will be my last. It feels like my time here is started to wind down, which is certainly bittersweet. As excited as I am to eat my favorite American foods and see my favorite people back home, it will be incredibly hard and sad to leave behind everything here. In the meantime, I am enjoying every minute and soaking in this incredible experience. 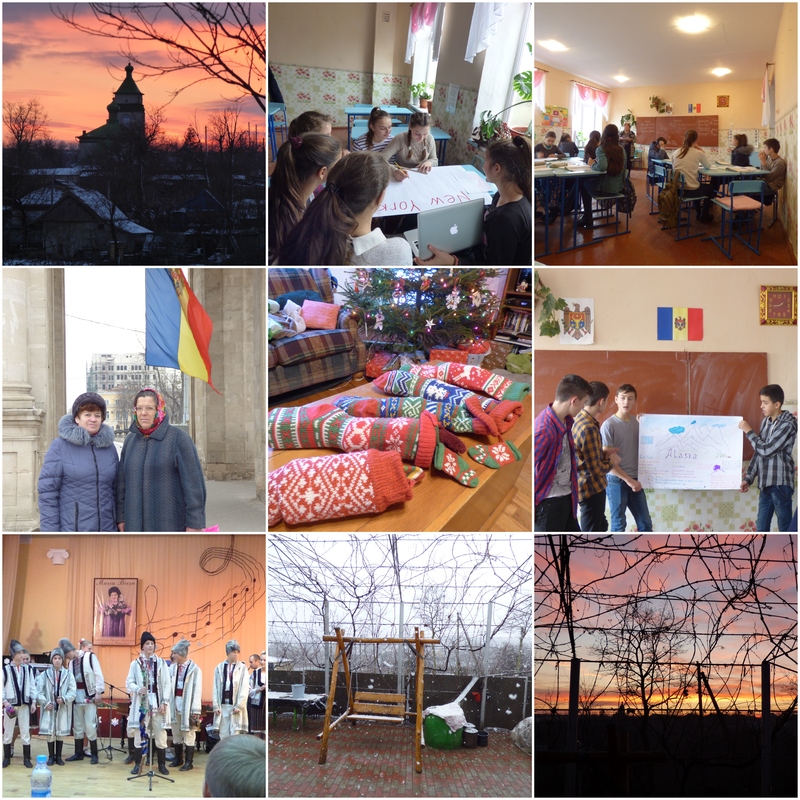 Here’s a recap of my third quarter in Moldova (you can find a recap of the first six months here, and a recap of the second six months here). The month kicked off with a celebration in the village park for Children’s Day with song, dance, and games. With the school year finished, I joined my fellow teachers on an excursion to the northern part of the country to visit Saharna and Țîpova Monasteries. Most of the month was spent at home spending time with my host mom and visiting host niece, Valerica. We picked strawberries, cherries, and raspberries. Our courtyard was filled with the sound of little ducklings. After months of torture from our rooster, he met his end and we ate him. 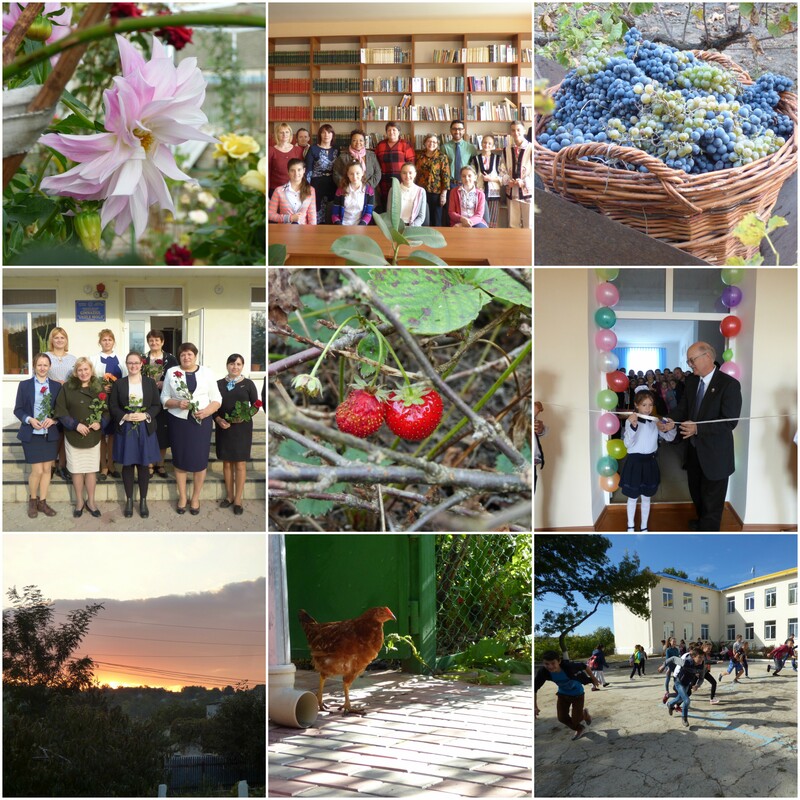 Our village welcomed a group of fellow Peace Corps Volunteers as they did a walking tour of the southeast of Moldova, visiting libraries, schools, and mayor’s offices to spread peace and friendship. I spent a wonderful night celebrating with my former 9th graders, their parents, and my fellow teachers in honor of the 9th grade graduation. There was a graduation ceremony, followed by plenty of food and dancing. My host nieces spent much of the month with us and we played plenty and had a lot of fun. I attended the opening of a monument in my village honoring those that were deported from the village during Soviet times. My parents came to Moldova and we spent an amazing two weeks exploring Moldova and Romania. We explored my village, Soroca, Orhei Vechi, Tipova Monastery, Purcari Winery, Comrat, Cricova Winery, and Chisinau. In Romania, we visited Sinaia, Bran Castle, Brasov, Rupea Fortress, Sighisoara, Maramures County with its wooden churches, and Breb. Valerica (my host-niece) spent a fun afternoon dressing up in my clothes, earrings, and sunglasses and pretending to be a model. I made my host nieces American-style pancakes (with real maple syrup!) and scrambled eggs. The library grant project I worked with my school on was underway and I took several trips to our raion center and Chisinau to procure furniture, technology, and new books. Heather, my sister, came to Moldova and we spent a weekend in the capital before heading to my village for a week. 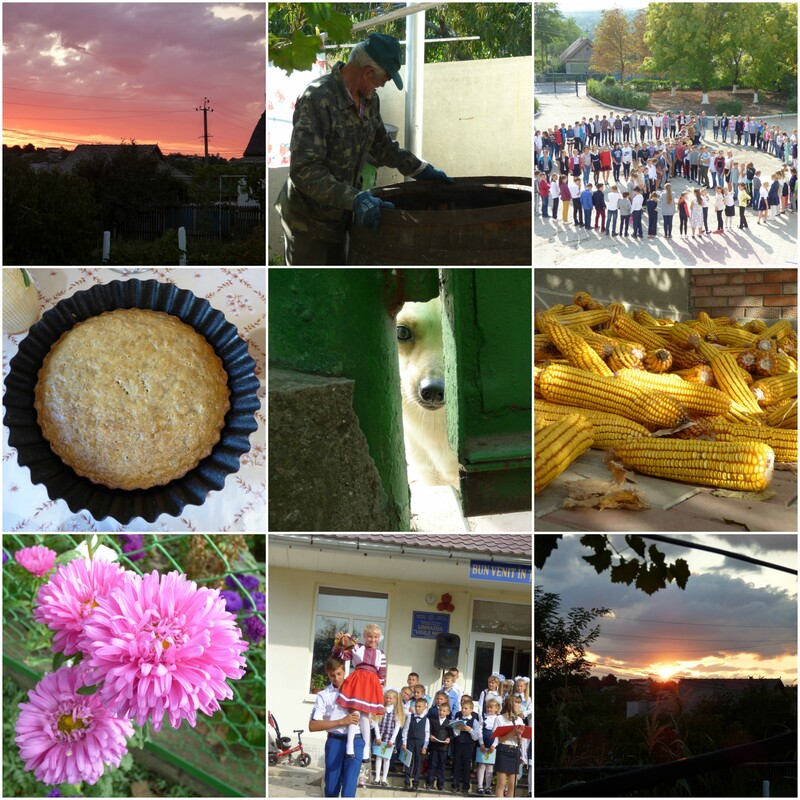 Together, we went to my village’s celebration of Language Day and Moldova’s Independence Day, where we ate and enjoyed the performances by my students and various competitions (and tried not to be too nervous during the pole-climbing competition). 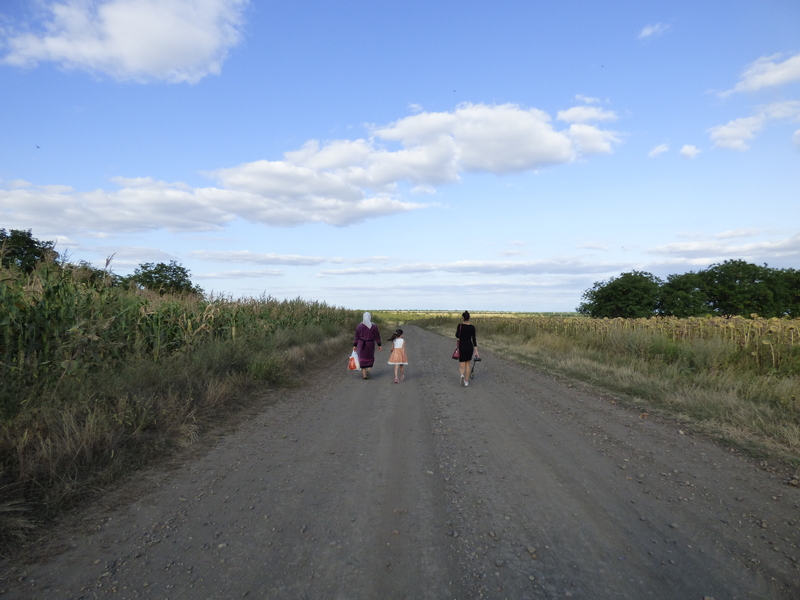 I visited Et Cetera Winery with my sister and a volunteer friend, and on our way, we walked through the fields at the margin of my village with my host mom, host sister, and host niece, enjoying the beauty of a summer evening in Moldova. I got a site mate (another volunteer living in the same village) and I spent some time working on projects with him at school. We celebrated the first day of school with the traditional First Bell ceremony. I said goodbye to my sister and got back into the swing of the school year. We celebrated International Day of Peace at school by making a huge peace sign in the school courtyard and students shared what peace means to them. I enjoyed the beautiful autumn sunsets over the village. The corn and grape harvest began, and I baked banana bread and chocolate chip cookies. At school, we completed our pre-tests for the year and the schedule changed many times. Autumn continued in my village, and along with came more pretty sunsets and making wine. One day, my host mom called me and told me to come to the garden in the valley to pick strawberries. Although a little confused, I joined her, and to my surprise there were autumn strawberries! At school, we celebrated Teacher’s Day and I joined the other teachers at a faculty party, where we ate yummy food and danced for hours. I finally mastered several different versions of Moldova’s traditional dance, the hora. We completed installing our library project and had an opening ceremony and celebration. Our English Club (with students from 7th through 9th grade) started up again. At the end of the month, our village received visitors from Peace Corps Headquarters in Washington, D.C. and after touring our school, we joined them and a group of other volunteers in our raion center for lunch. I spent our autumn vacation in Chisinau, attending a conference and catching up with friends. Our English Club continued. My village celebrated Hram (Village Day) and I attended the concert held at our Casa de Cultura (Cultural House). I made cinnamon and dinner rolls for Thanksgiving and spent a weekend in Chisinau with other volunteers for Thanksgiving. I attended the school’s celebrations for Youth Day, with skits, songs, and dance. It’s been a pretty good and fairly busy past 6 months! Here’s to the last part of this journey and my remaining time in Moldova!